Present state: Demolished. The site has been lost under new housing and a parade of shops. Old Station Close stands on the site. Notes: Five years after the East Grinstead line opened Grange Road was opened. 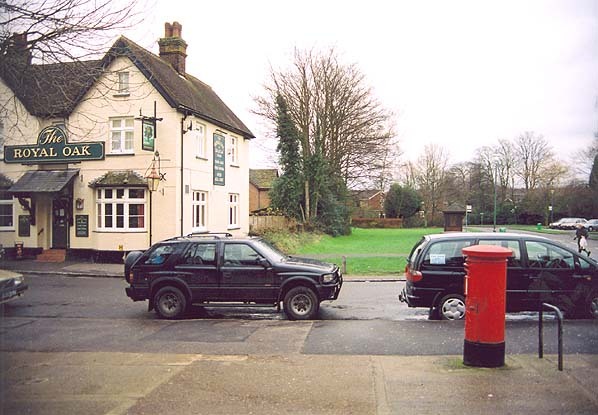 Although right beside the village of Crawley Down it was named 'Grange Road' presumably in deference to the owner of 'The Grange' which lay to the south of the line. At first only three trains a day called there but after a few weeks all trains stopped by request. It remained a request stop until 1865 and was rebuilt in 1876. Following a public meeting in 1852, the East Grinstead Railway Company was in formed and in November of that year applied to parliament for powers to construct a 6 3/4 mile branch line from a terminus at East Grinstead to a junction with the London Brighton & South Coast Railway's main line at Three Bridges. The bill received Royal Assent on 8th July 1853 and the branch line opened on 9th July 1855 with a single intermediate station at Rowfant; a second station at Grange Road was added in April 1860. The new line was an immediate success carrying both passengers and goods. Even before the line opened there was talk of an extension to Tunbridge Wells and the East Grinstead Groombridge and Tunbridge Wells Railway Act was passed on 7th August 1862. Prior to this date the Brighton, Uckfield and Tunbridge Wells Railway had their Act passed in 1861 for an extension from the existing terminus at Uckfield to a new terminus at Tunbridge Wells and work on this line had already started in April 1862. The EGG & TWR proposed to obtain powers to run over the BU & TWR line between Groombridge and Tunbridge Wells but before either line was opened the two companies were absorbed into the London Brighton & South Coast Railway in January 1865. There were three intermediate stations at Forest Row, Hartfield and Withyham. Despite the success of the original line to East Grinstead, the extension proved less popular and the initial passenger service of 6 trains each way per day was soon reduced to save money, the goods service was however more profitable. The extension from Uckfield to Groombridge was opened on 3rd August 1868 and on 1st February 1876 a short spur through Grove Tunnel was opened between the LBSC terminus and Tunbridge Wells to a junction with the South Eastern Railway south of their own station in the town to allow the running of through trains. On 5th April 1880 the LBSC extended their line from Hailsham to a junction with the Uckfield line at Eridge with services running on into Tunbridge Wells. 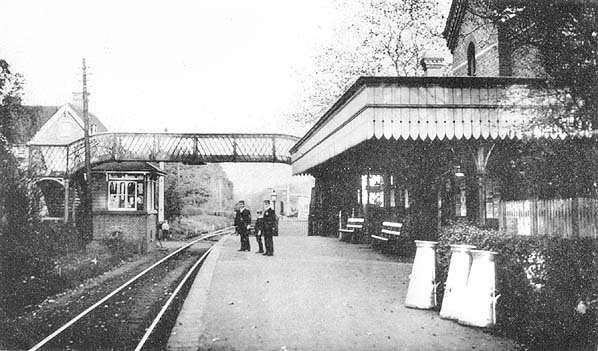 With the opening of the Lewes & East Grinstead Railway and the Croydon, Oxted and East Grinstead Railway in 1883 it was once again necessary to resite East Grinstead Station. The two new lines approached the Three Bridges line at right angles from the north and south respectively. 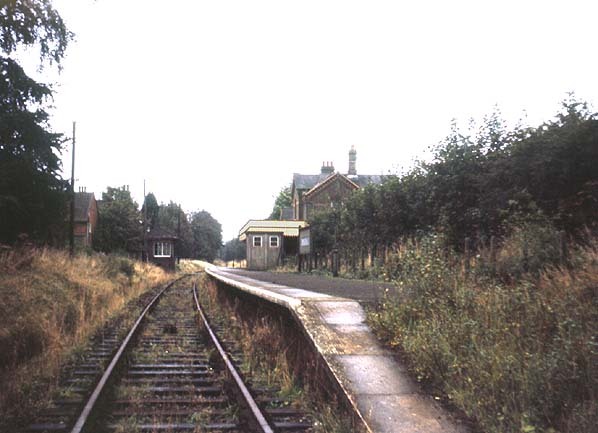 Because of the angle it was impossible to take the L & GR into the existing station so a new station was built quarter of a mile to the west with two island platforms on the old line above and at right angles to a new station at the end on junction between the EGR and the CO & EGR with a sharply curving spur linking the two lines. The final line in the equation was the Oxted and Groombridge Railway which opened on 1st October 1888 bringing yet another service into Tunbridge Wells. The opening of these new routes from London all reduced passenger numbers on the line from Three Bridges which was now the longest out of four routes from London to Tunbridge Wells. Only one intermediate station, Forest Row was able to build up quite respectable commuter traffic to London with several trains terminating there. With ever rising operating costs a new rail motor service consisting of a single carriage hauled or propelled by a small tank engine was introduced in 1906. A new halt was opened at High Rocks between Groombridge and Tunbridge Wells, served only by the rail motors. These new trains eventually halted the decline in passenger revenue with the service reaching its peak in 1914. WW1 had little affect on the line and some new services were introduced following the formation of the Southern Railway in 1923. WW2 brought a reduction in services with the withdrawal of the rail motors. A government oil store was established at Rowfant bringing an increase in freight traffic. After the war some passenger services were reinstated but by 1950 both passenger and freight service were in decline and BR was considering the possible closure of the line between Three Bridges and Ashurst Junction in 1951 with passenger numbers at Hartfield in 1949 being only a quarter of those carried in 1923. Despite strong local objections and a new timetable, Barbara Castle confirmed closure of the line between Three Bridges and Groombridge from 1st January 1967. Although originally proposed for closure the section between Groombridge and Tunbridge Wells West (West was added to the name in 1923) remained open. Track lifting began at the east end of the line late in 1967 and was not completed until 1970. In July 1979 much of the trackbed between Three Bridges and East Grinstead was turned into a public footpath and cycleway known as Worth Way. The 9 1/2 mile section of line between East Grinstead and Groombridge has also been converted into a public footpath and cycleway known as Forest Way. Although the route into Tunbridge Wells West remained open there was no investment in the line and by the early 1980's the track and signaling needed replacing. With the planned removal of Grove Junction during the upgrade of the Tonbridge - Hastings line British Rail decided they could no longer justify keeping the line open and announced closure of the line from 16th May 1983. Once again there were strong objections but these were outweighed by British Rail's cost argument. They estimated that to upgrade the infrastructure, while retaining the existing services, would give a £175,000 loss per year and the Secretary of State confirmed closure of the line on 6th July 1985. The Spa Valley Railways now runs for 3 1/2 miles to a new station at Groombridge with an intermediate station at High Rocks built by the owner of the High Rocks Inn and Restaurant.